Did we get ya yesterday? “Suits and Dogs” was our April Fools joke! However, I think we might be on to something. Skotte looks GOOD in a suit, eh?!?! You guys seem to like the idea, even if you knew it was a practical joke! Did any other jokes catch you unaware yesterday? My mom totally got me. We planted seeds Sunday night. Yesterday, just after lunch, Mom exclaimed, “Wow, the seeds are already an inch tall! Come see them!” Skeptical, I ran in to look. I thought maybe she was looking at the impatiens which I planted earlier. As I was inspecting the seed trays, she yelled from the kitchen, “April Fools!” Drat, she got me! 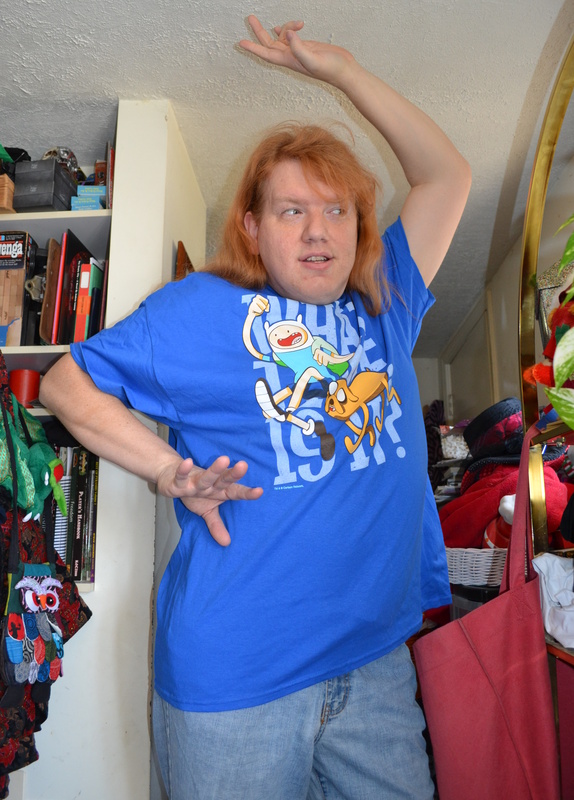 Today’s shirt came from a Nerd Block, which is a fun box of things that arrive each month for a fee. There are a number of these boxes, but we picked this one because it includes a tshirt. Are you familiar with Adventure Time? If not, you should be! It’s great fun. It airs on Cartoon Network. My favorite character is Marceline, the Vampire Queen. She’s actually half vampire, half demon, and she’s musical! Wear tshirts, dance wildly, have adventures and be happy!